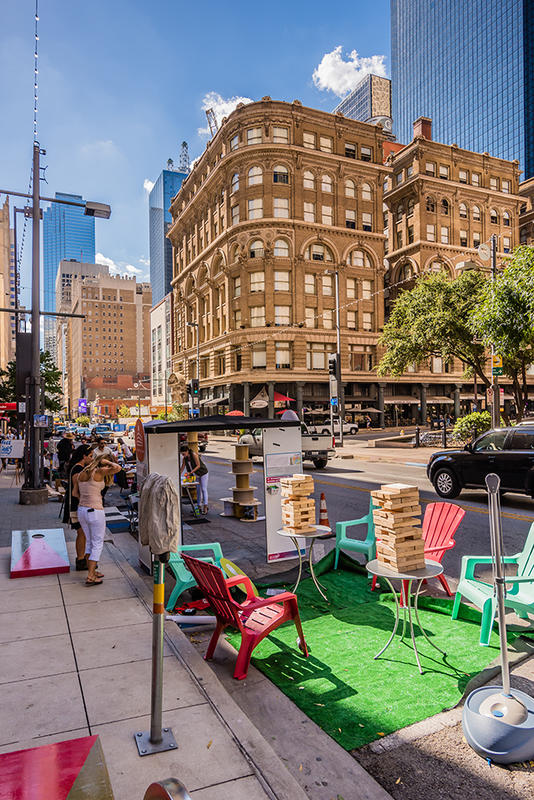 Downtown Dallas was transformed so that it’s many parking lots became miniature parks for public use on Sept. 18 as part of a global emphasis (160 cities) known as PARK(ing) Day. 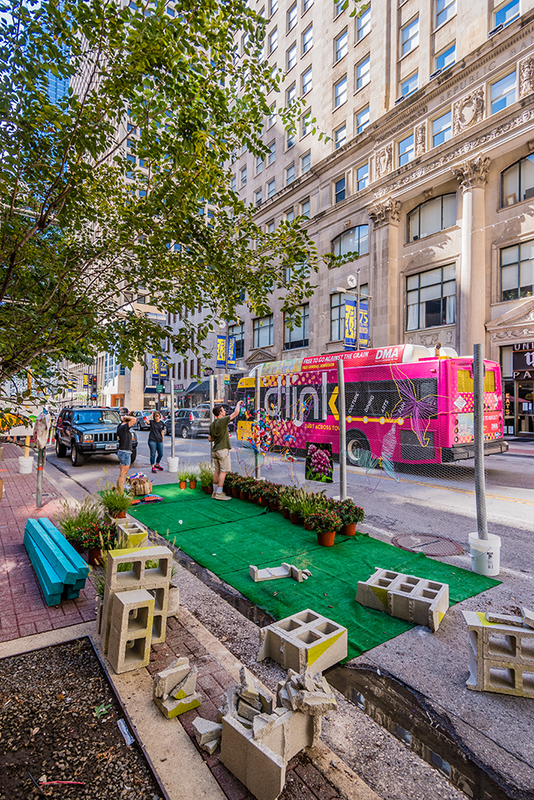 Artists, designers, activists, businesses, and residents temporarily transformed metered parking spaces into public parks and other social spaces. 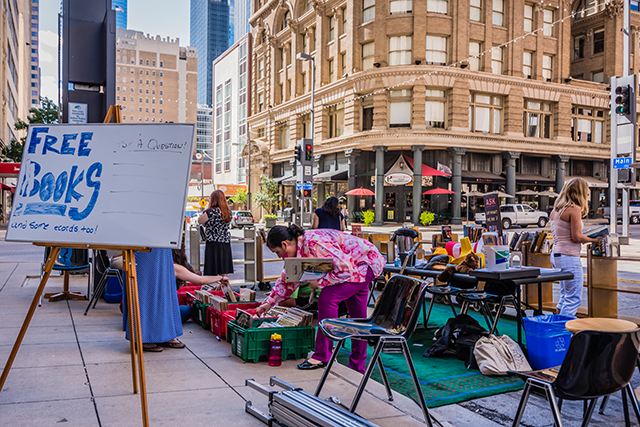 The event promoted social interaction, civic engagement, critical thinking, and creativity through individual generosity and play. 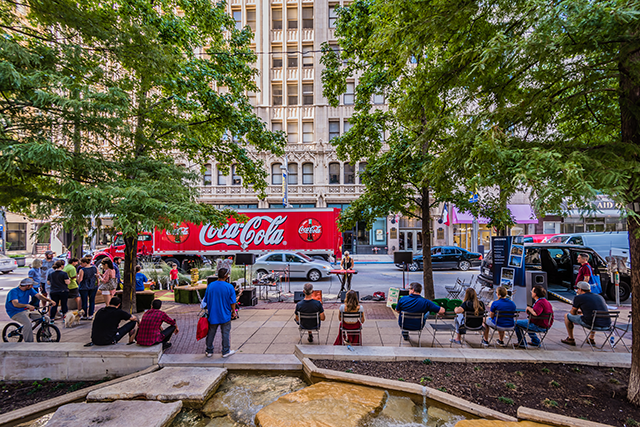 The event marked Dallas’ fifth year participating in PARK(ing) Day. 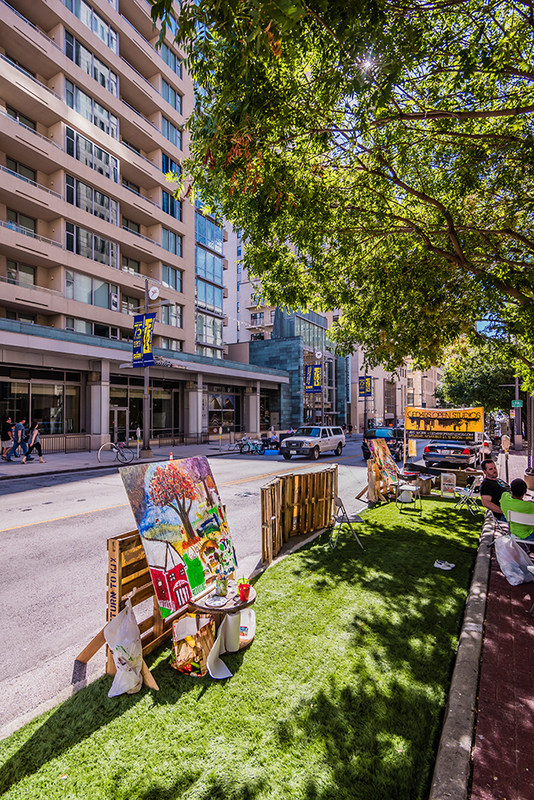 On that day, city-dwellers transformed parking spaces on several blocks along Main Street (between Field Street and South Harwood Street). 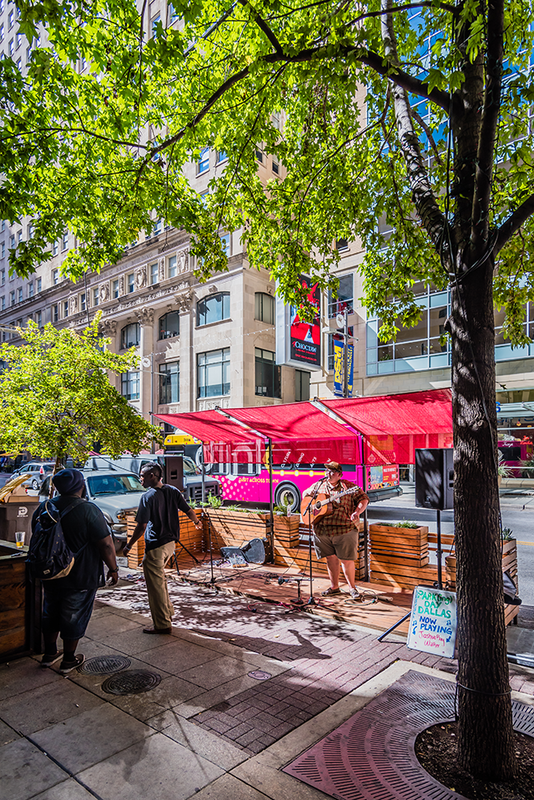 Visitors were encouraged to learn, play, and interact within these pint-sized parks. 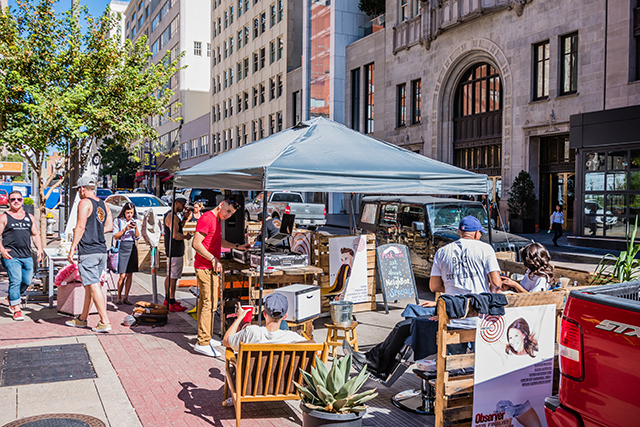 The event aimed to attract downtown residents, office workers, and visitors and exposed them to a host of activities including day-long musical and dance performances, games, areas for people to gather, relax, work, and socialize for the day. Passersby could experience a wide range of themed parks including a tiny Aztec jungle, little library, photo booth, yoga studio, mini boardwalk, art gallery, and more. 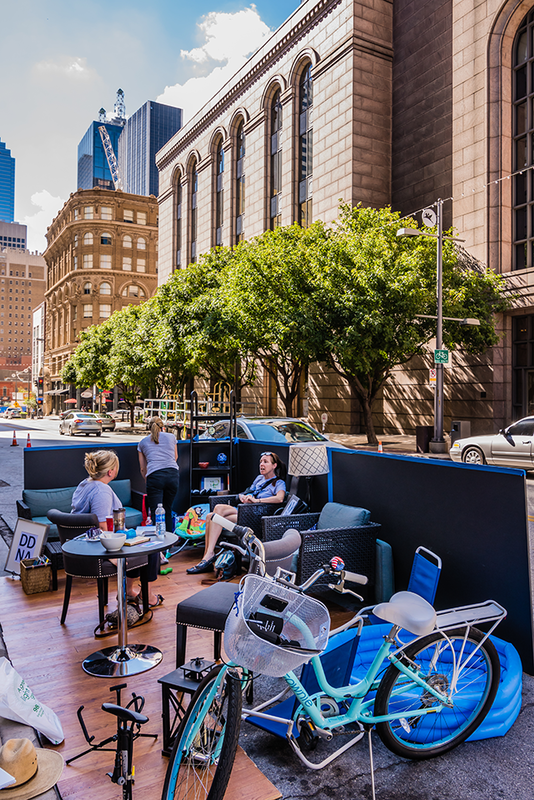 PARK(ing) Day Dallas 2015 participants include Downtown Dallas Inc., bcWORKSHOP, Acme Creation Lab, Studio Outside, The Grove, Volunteer Now, Which Which, DogFitDallas, Vertigo 12 Hair Lounge, Dallas Public Library, The Trust for Public Land, Nasher Sculpture Center, TBG Partners, Simple Civilian, Zipcar, Anita N. Martinez Ballet Folklorico, Susaita Studio, Traylor Law Firm, Imaginary Fiends, New York Life/Leighton Wood, LTV Tower, Cedars Neighborhood Association, Cedars Open Studios, University of North Texas System, University of North Texas Dallas College of Law, The University of Texas at Arlington SASLA (Student American Society of Landscape Architecture), City of Dallas Waste Diversion, Della’s House of Giving, Laundri, Benchmark Environmental, Mend, Downtown Dallas Neighborhood Association, Immerss, Utterly Organic, Apogii, Artemis Fine Art Services, Iron Cactus, Photo Wagon, Callison & RTKL, AquaTerra Outdoors, eBook by Krooks Publishing, and Summit Climbing Gym.